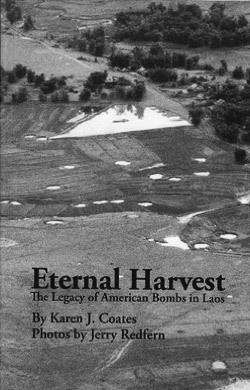 I've seen documentaries on UXOs in Laos but I think this has to be the first book I've read that profiled this topic alone. At 375 pages (including the index and photos), it's a good read and well worth the price that I paid. I bought the book (a used copy) off Amazon.com for a great price. Its original price, as noted above, is already a great price! Highly recommended. When I read this book, it was chilling to know that there's somewhat of a pervasive acceptance of UXOs among the townspeople. Perhaps not because they want to accept it but because they have no choice. It's human resilience. However when the tragedies hit, it also illustrates the fragility of that acceptance. People who live in heavily infested areas deal with UXOs the most. Having said that, the books goes on to describe how the widespread existence of UXOs in some towns and villages has spawned a scrap metal industry. The book mentions that when scrap metals prices increase, more people get involved. And inevitably the casualty count increases as well. Some scrap metal searchers, when interviewed, acknowledged the risks but admitted they do it for the money. In poor villages, where work and sources of income may be difficult or limited, the scrap metal industry has presented itself as an opportunity, albeit a risky and sometimes deadly one. What do you find being used with the scrap metal? The book shows us spoons, ash trays, tools, raised bed vegetable gardens and planters, etc. On the one hand you can't help but admire the inventive uses but on the other hand we have to keep in mind that such an industry is still a deadly one to those who are involved in the search for the raw materials. 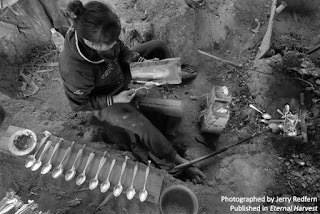 Photo of a Hmong woman crying at the funeral of her husband who died from a UXO. However what makes the ordeal even more dramatic is the possible cause was due in part to a neighbouring Hmong tribe. They believe the neighbouring tribe set up the bomb because they did not want them trespassing on their land. If true, it would be a sad situation knowing that the UXOs are being used by the locals against each other. Important note that although the majority of the aerial bombings were done by American forces, the author notes that the Armed Forces of Laos itself, Thailand, and South Vietnam, also did the same but obviously not on the same scale as the Americans. There's also a section that illustrates and explains what kinds of bombs there are. I found it insightful as I hadn't seen it explained in such detail. While most bombies and other UXO are found mostly in the ground, they've also been found in trees where they've been stuck in between branches and tree trunks. Sections that discuss those who are helping to try to alleviate this UXO situation is also very wonderful to read and gives the reader some hope as well.